Background: The production of silk is a multidimensional and multistep process involving exposure of workers to allergens at work place. The silk allergen has been implicated in the development of bronchial asthma. Objectives: To identify the prevalence of occupational asthma (OA) and to identify sensitization to silk allergen and among workers in silk filature units. Materials and Methods: A community-based cross-sectional study was conducted in silk filature units of Ramanagara (Silk City) in Karnataka, South India, for a period of 6 months. One hundred and twenty workers of silk filature units who met the inclusion and exclusion criteria were recruited into the study group. For comparison, a control group comprising of 120 individuals not working in silk filature units was constituted. All the subjects were interviewed using the standardized International Union against Tuberculosis and Lung Diseases (IUATLD) Questionnaire and subjected to the skin prick test, which used the extracts of silk allergen. Results: The study group comprised of 35 males and 85 females, whereas the control group comprised of 58 males and 62 females. The prevalence of occupational asthma among workers in silk filatures was 20.83%. It was observed that 35.83% of those in the study group and 20.83% of those in the control group were found to be sensitive to silk allergen. This difference was statistically significant (χ2 = 6.64; P < 0.05). Conclusion: There is a high burden of sensitization to silk allergen and occupational asthma among silk filature workers in South India. There are no further studies on occupational asthma in sericulture in India after a study by Harindranath et al., in 1985. Thus this study was undertaken to identify the prevalence of occupational asthma and silk allergen sensitization among workers of silk filature units in Ramanagara also known as Silk City of Karnataka, India. After obtaining approval from the Institutional Ethics Committee, a community-based cross-sectional study was conducted in silk filature units of Ramanagara in South India for a duration of 6 months. The sample size was calculated based on the prevalence of 16.9% in the previous study  and precision of 10%, which amounts to 56. With doubling effect, it was rounded off to 120. Silk filature units in Ramanagara town were visited randomly and their owners were briefed about the purpose of the study. All the workers of filature units who were willing to participate were included after taking their informed consent. One hundred and twenty subjects aged between 18 and 60 years, working in silk filatures for a minimum period of 6 months were included in the study group. Individuals who were unable to comprehend instructions and successfully perform spirometry as per ATS guidelines, and those in whom spirometry and skin prick test were contraindicated, were excluded. The control group consisted of 120 subjects who were selected from the same geographical area and fulfilling the inclusion and exclusion criteria but not working in silk filatures. Data were tabulated using Microsoft Excel software and analyzed using SPSS version 19.0. Statistical analysis was done using descriptive statistics such as proportions and inferential statistics such as Chi-square test. The study group consisted of 35 males and 85 females of whom 45 (37.5%) were in the age group of 21-30 years. 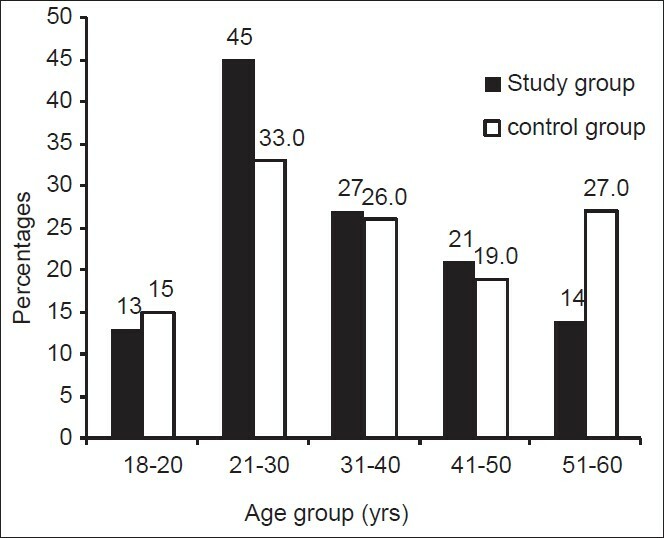 58 males and 62 females made up the control group, of whom 33 (27.5%) were aged between of 21 and 30 years [Figure 1]. The mean age was 34.14 ± 2.84 and 40.59 ± 14.40 in the study and control groups, respectively. 83 (69.17%) individuals and 50 (41.67%) individuals in the study and control groups, respectively, were illiterate [Table 1]. In the study group, 90 (75%) were working in reeling units, 7 (5.83%) in the boiling section, 3 (2.5%) in sorting, and 2 (1.67%) in weaving. Forty-eight (40%) of them had been working for a period ranging between 11 and 20 years. The prevalence of bronchial asthma based on the questionnaire was 35 (29.16%) in the study group and 8 (6.6%) in the control group. This difference was statistically significant (χ2 = 20.65; P < 0.05 [Table 2]. In the study group, 25 (20.83%) of these 35 individuals had increased symptoms at work and a decrease/absence of symptoms away from work along with sensitivity to silk allergen, thus suggesting occupational asthma [Figure 2]. Of these 25 subjects, 18 (15%) were confirmed to be having obstruction by spirometry as per ATS guidelines. A patient with a positive history and with evidence of sensitization to a known immunologic agent has an 80% chance of reacting to a specific agent on challenge, which is diagnostic of occupational asthma. Hence the prevalence of occupational asthma was calculated as 20.83% in our study. 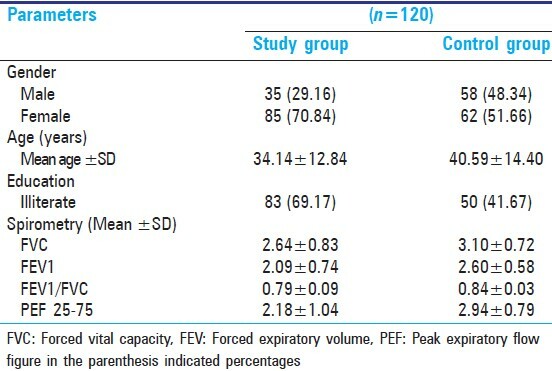 Out of the 35 subjects who are "positive" as per the questionnaire definition of asthma, 23 had an FEV1/FVC ratio <0.7, 28 had a FEV1 <80%, and 33 subjects had PEF <65%, which is suggestive of obstruction as per ATS guidelines. Eighteen subjects showed an FEV1 reversibility of >12% and 200 mL in response to bronchodilator administration. Among the eight subjects in the control group who are "positive" as per the questionnaire, five subjects had an FEV1/FVC ratio <0.7 and FEV1 <80%, and all eight subjects had a PEF <65%, which is suggestive of obstruction. Sensitization to silk allergen was identified by the skin prick test. Results from the study group showed that 22 (18.33%) individuals were sensitive to pupae, 42 (35%) to cocoon, and 35 (29.17%) to sericin. In the control group, the skin prick test revealed that 4 (3.33%) individuals were sensitive to pupae, 21 (17.5%) to cocoon, and 6 (5%) to sericin. Overall silk allergen sensitivity (sensitivity to one of the three allergens) was 35.83% and 20.83% in the study and the control groups, respectively [Table 3]. The difference in allergen sensitivity between the study and the control groups was statistically significant (χ2 = 6.64; P < 0.05) [Table 4]. A positive family history of asthma was found in 16 (13.33%) study subjects and 9 (7.5%) control subjects. Among the study subjects, 42% had allergic rhinitis, 31.67% had allergic conjunctivitis, and 19.17% had urticaria. This study revealed that the prevalence of occupational asthma among workers in silk filature units was 20.83%, and 29.16% of study subjects were suffering from bronchial asthma. Extensive review of literature showed that there was only one study conducted among silk workers in India by Harindranath et al., in 1985, which showed that 16.9% of subjects had asthma of occupational origin and 36.2% of the subjects who were engaged in processing of natural silk suffered from bronchial asthma. In their study, the skin prick test was performed using crude silkworm cocoon and pupal allergen extract. Results showed that 28.8% of the subjects were sensitive to silk allergen. However, in our study we observed a higher prevalence of occupational asthma. Sericulture is also an important industry in China. In a community-based cross-sectional study conducted in China in 2001, by Juan et al., it was seen that 8.5% of asthmatics were sensitive to silk allergen. However, our study showed that sensitization to silk allergen was higher at 35.83%, which is more than that seen in both of the above studies. In our study, it was observed that 18 (15%) asymptomatic workers in the filature units showed a positive skin prick test for silk allergens. Twenty-five (20.83%) individuals in the control group (who are not working in silk filature units but are living in that area) were also sensitive to silk allergens. This indicates that these subjects are at risk of developing occupational asthma and other allergic disorders due to silk allergen in later years, due to its continual release into the environment from filature units. We thus conclude that there is high burden of silk allergen sensitivity and bronchial asthma of occupational origin among the workers of silk filature units in Ramanagara. It is recommended that health education to be given regarding the signs and symptoms of bronchial asthma, to enable its early diagnosis and treatment and to prevent complications. Appropriate preventive measures to reduce/prevent exposure to silk allergen among silk industry workers is advised. Adoption of newer technology such as Automated Reeling Machine, which reduces the release of silk allergen into the environment and contact with human beings will greatly reduce the burden of silk-induced asthma in this geographical area. Serial peak flowmeter reading and specific allergen challenge tests, which increases the authenticity of diagnosis of occupational asthma, were not done due to feasibility and resource constraints. The study was supported by a research grant from the Medical Education and Research Trust (MERT), Bangalore, India. We thank Mr M K Vijayeendra, Scientist D, KSSR and DI, Bangalore, Department of Sericulture, Government of Karnataka, India, for providing his assistance during the study. We also thank the faculty of the Department of Community Medicine and the Department of Pulmonary Medicine at Kempegowda Institute of Medical Sciences (KIMS), Bangalore. Our sincere gratitude to all the participant subjects for their cooperation and support during the study. Bernstein IL, Chan-Yeung M, Malo JL, Bernstein DI. Asthma in the workplace. 3 rd edn. New York: Taylor and Francis; 2006. p. 825-66. Harindranath N, Prakash O, Subba Rao PV. 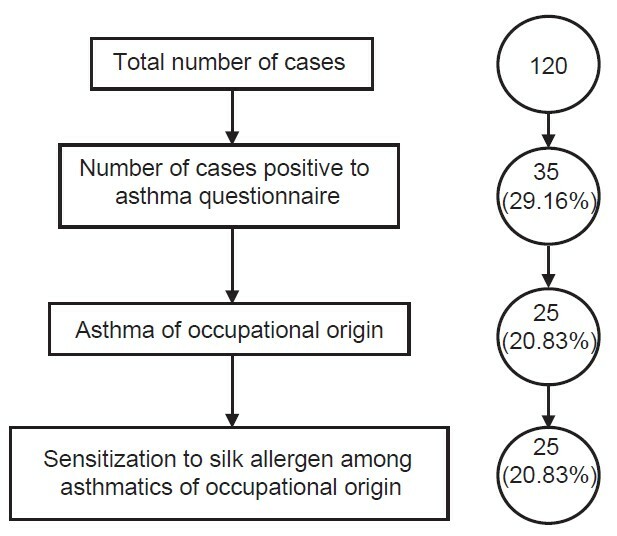 Prevalence of occupational asthma in silk filatures. Ann Allergy 1985;55:511-5. Chan Yeung M, Malo JL. Aetiological agents in occupational asthma. Eur Respir J 1994;7:346-71. Available from: http://www.karnataka.gov.in/sericulture. [Last accessed on 2014 Feb 23]. Zaoming W, Codina R, Fernández-Caldas E, Lockey RF. Partial characterization of the silk allergens in mulberry silk extract. J Allergy Clin Immunol 1996;6:237-41. Fueki R, Kobayashi S. Some aspects of Occupational asthma in Japan-Peak flow diary and Sericulture asthma. Allergy 1988;8:71-5. Torén K, Brisman J, Järvholm B. Asthma and asthma like symptoms in adults assessed by Questionnaire. Chest 1993;104:600-8. Jindal SK, Gupta D, Aggarwal AN, Jindal RC, Singh V. Study of the prevalence of asthma in adults in North India using a standardized field questionnaire. J Asthma 2000;37:345-51. Smith AB, Castellan RM, Lewis D, Matte T. Guidelines for epidemiological assessment of occupational asthma. J Allergy Clin Immunol November 1989;84:794-804. Miller MR, Hankinson J, Brusasco V, Burgos F, Casaburi R, Coates A, et al. Standardization of Spirometry. Eur Respir J 2005;26:319-38. Gaur SN, Singh BP, Singh AB, Vijayan VK, Agarwal MK. Guidelines for practice of allergen immunotherapy in India. Indian J Allergy Asthma Immunol 2009;23:1-21. Khan YR, McDonough P, Cockcroft DW, David BE, Hendeles L. Nebulizer output for methacholine challenges with the KoKoDigidoser. J Allergy Clin Immunol 2005;116:924-6. Celedón JC, Palmer LJ, Xu X, Wang B, Fang Z, Weiss ST. Sensitization to silk and childhood asthma in rural China. Pediatrics 2001;107:E80.